That James Beard is so dependable. You can always count on him to give at least a mention of even the most obscure ingredients used in American cooking. 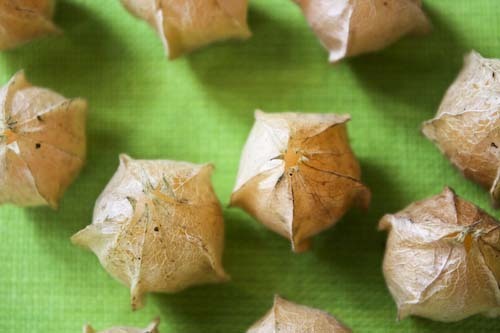 These ground cherries are another farmers market find, a unique little fruit that Beard claims "used to be one of the more common." Beard says that while they grow wild in many parts of the US, they tend to be actively cultivated in Pennsylvanian and the West. So it makes sense that one of the few other cookbooks to mention them is Marcia Adams in Heartland: The Best of the Old and the New from Midwest Kitchens. Adams made a name for herself party through her earlier book Cooking From Quilt Country which focuses on Amish and Mennonite cooking. InHeartland she provides a recipe for Ground Cherry Pie, a dish that I'd already run across here. Of the three preparations I discovered, a pie sounds really delicious, but I'm holding off until I can get a lesson in pie crust from my grandmother (that's you, Nana!). It's one of the skills I think might be better taught in person rather than learned in a book. But anyway. Adams describes the ground cherry as being quite a low-maintenance plant, growing close to the ground "along uncut country roadsides and in uncultivated fields." You know when the fruit is ripe when it drops from the bush, thus the name "ground cherry." You might also find them called husk tomatoes, chew cherries, strawberry tomatoes and winter cherries. Beard says they're similar to the Australian Cape gooseberry, which is seemingly just a larger variety. 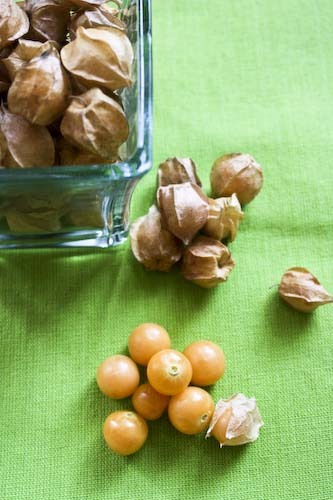 In Europe, Beard tells us, the tendency is to use ground cherries for preserves. And indeed, the third book I found that mentions them at all, the resolutely American Farm Journal's Country Cookbook from 1959, offers a Ground Cherry Marmalade which consists of the cherries, pears and crushed pineapple. It sounds like a dream, however the problem I have with making my own preserves is that I literally have nowhere to store the product in my teensy apartment. Back to Beard, since both pie and preserves were out, his Poached Ground-Cherries were a natural choice. Personally, I'm a sucker for warm fruit on cold ice-cream, which can be seen as part of my plan to deny the end of summer. 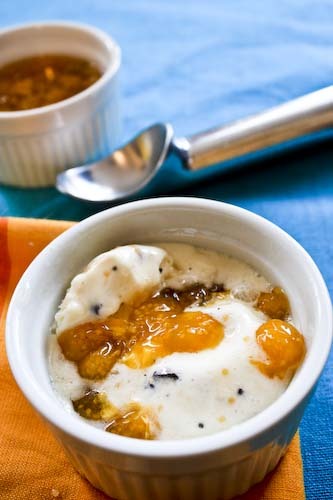 So I give you Poached Ground-Cherries over ice-cream. If you have a sponge or angel cake waiting in the wings, this would also be lovely as a topping with whipped cream. Combine the sugar and the water. Make a simple syrup by bringing it to a boil for 8-10 minutes. Add the lemon slices and the ground-cherries and cook for 5 minutes at a rolling boil. As the fruit mixture boils, remove any scum (I hate that word!) that forms. Reduce the heat and simmer until the ground-cherries are just cooked through, about 12 minutes total. Cool the cherries in the syrup and top whatever you like to your heart's content. I have to say, I'm in complete agreement with Mr. Beard when he writes: "When eaten raw [ground-cherries] are refreshingly sweet and rich. It is mystifying to me that they are not more prized." 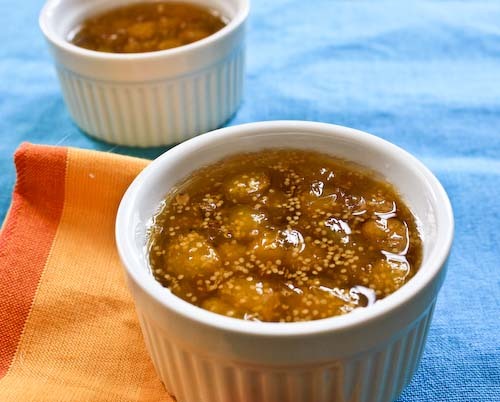 Since ground-cherries are a decidedly autumnal ingredient, I'm sending this post in to Maninas: Food Matters for the Eating with the Seasons: October event! Interesting. I was guessing there was a gooseberry link because of the husk. Were they sour like gooseberries? There really weren't sour at all. They were a bit more tart once poached, but out of hand they smelled kind of like pineapple but had a vaguely tomato-y taste, only sweeter. It's hard to described! Lovely! It's been forever since I have ad any. At the restaurant they were so expensive that I had to limit their use to decoration on dessert but just to pop one in my mouth again....hmmhmmmhmmm!!! 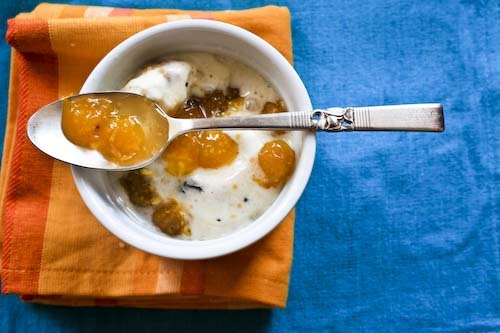 I have never had ground cherries, I honestly don't even think I have ever heard of them but I agree with you about the warm fruit and cold ice cream combination. Wow - I've never heard of ground cherries! I bet the poached cherries are super delicious on some vanilla ice cream .. yum! I really wish I paid more attention when my grandmother was still well and cooking - I hear she was an awesome cook, but I don't really remember b/c I was a little kid and didn't understand the value of learning from my relatives. Hopefully I will get to learn from my mom, who is also an awesome cook! I only see her once or twice a year, so I should make the time count! Another new one on me. Look great! Have not seen those cherries before! Mmm, warm and cold, fruit and ice cream - it's the best pairing in the world. Thanks for the tips - I'm hoping there are some ground cherries still about at this weekends market. Tartelette, they weren't too bad at the farmers market, but I suppose they don't yield much in terms of volume, so I can definitely see them being cost prohibitive! Esi and Claire, the other thing I love about warm fruit on cold ice cream is that it's like pie alla mode without the crust, which is marginally less fattening! Carmen, I know what you mean. I used to have such easy access to my grandmother, but now that I'm out of the house it's much harder. Wish I'd been paying better attention! Candy and Tigerfish, I hadn't seen them before this autumn either. Or I may have seen them bus wasn't aware enough of them to notice. They're interesting little things! How cool! I've heard of ground cherries (probably via a Euell Gibbons book) but I've never had one and I've never seen them for sale. By the way, I love the Farm Journal's Country Cookbook that you mention. It's a fascinating glimpse into another era and I find things there I see nowhere else. 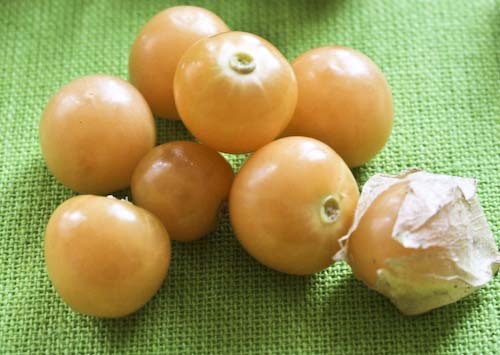 Of course, James Beard and ground cherries? Who knew.